PT Kereta Api Indonesia (Persero) - KAI or referred to as "KAI Group" is the national railways company of Indonesia and is wholly-owned by the Government of Indonesia. Headquartered in Bandung West Java, KAI Group operates primarily as an operator of railways services in Java and Sumatera regions. The Company running business in the field of integrated railway transportation services. 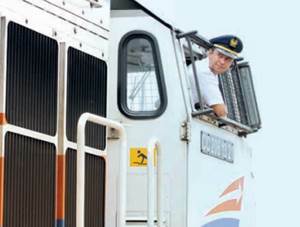 Its business include providing, organizing and managing railway transportation services. In term of office network, KAI Group now has 9 Operation Area Offices (DAOP), Regional Division Offices (DIVRE) and 6 Balai Yasa spread across Indonesia. KAI Group also supported 6 key subsidiaries; namely PT Kereta Api Logistik, PT Kereta Api Properti Manajemen, PT Kereta Api Pariwisata), PT Kereta Api Indonesia Commuter Jabodetabek, PT Reska Multi Usaha, and PT Railink. KAI Group recorded a satisfiying operational result in 2014. KAI Group registered total passengers of 80.35 millions passengers in the full year of 2014 or 26.3% growth as compared with 221.73 million passengers in 2013, according to PT Kereta Api Indonesia (Persero) Annual Report 2014 as quoted by JobsCDC.com. In terms of profit, total net profit increased 68.3% from Rp 561 billion in 2013 to Rp 949 billion in 2014. S1 : minimum 23 years and maximum of 35 years old. D3 : minimum 22 years and maximum of 30 years old. Minimum accredited "A" for S1 and "B" for D3 on the date of graduation. Minimum height of 160 cm for Male and 155 for Female with ideal/balanced weight. Well-behaved with evidenced by SKCK. Candidates with certificate of graduation (SKL) are welcome to apply (Note: the original diploma / transcript must exist at the time of signing of the contract). JobsCDC.com now available on android device. Download now on Google Play here. Please be aware of recruitment fraud. The entire stage of this selection process is free of charge. PT Kereta Api Indonesia (Persero) - D3, S1 Fresh Graduate External Program KAI Group July 2016 will never ask for fees or upfront payments for any purposes during the recruitment process such as transportation and accommodation.